Added on June 29, 2013 by Erin White. In an ecological sense, the zones where particular systems meet are the richest in species diversity, are quickest to respond to environmental shifts, and are places to learn not about either system specifically, but rather about how systems interact. On a rocky coastline, for instance, a particular ecosystem of grasses, lichens, snails, mice, and perhaps tall pine trees can be found above the high tide line, and another ecosystem with corals, sea slugs, fish, seaweed, and maybe a lobster or crab exists below the low tide line. In between is a space that is sometimes submerged, and sometimes dry. The tide washes in and brings seaweed and fish, but prevents trees from taking root, or mice from making nests. The tide washes out, drying the roots of some salt-hardy plants, and exposing the rocks and shallow tidepools to shorebirds. This in-between space is sort of both, but also neither. There is an overlap, but in this overlap are also species that only exist in the in-between. Barnacles, limpets, and snails thrive in this part-wet and part-dry zone, this thin ribbon of both-and that wraps the entire shoreline, anywhere the sea meets the land. 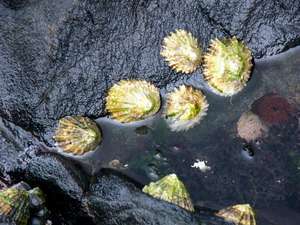 In the same way that ecosystems overlap to create the in-between zone of species richness and the emergence of new multi-state habitat occupied with creatures like limpets and barnacles that thrive there, any other kinds of systems can overlap and produce diversity and greater capability for resilience. Design systems, political systems, food systems, or educational systems - these all have overlap and in the overlaps are the in-between. As a design firm in the process of defining itself, we think of ourselves as part of an in-between zone, working the space between design and food systems, developing expertise and experience in both, and most importantly building the new forms of inquiry and partnerships that can only live in the in-between. Because it is a process of self-definition, and because we are looking for the new, right forms and methods, it will be an iterative process towards success. Some attempts will fail, some will teach us how to succeed. Learning is the nature of the in-between zone.